-leave a comment below with your name!! *giveaway ends Monday, July 12! Seed: Can you give a brief description of what 31 Bits is all about? 31 Bits: 31 Bits is a socially minded business that seeks to create sustainability through fair trade in developing countries. 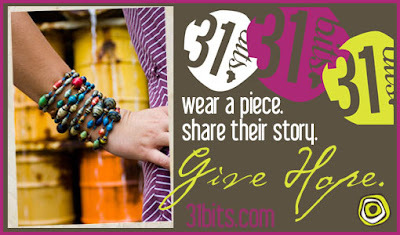 31 Bits sells beautiful hand crafted jewelry that is made by displaced women living in Northern Uganda. Through fair trade, 31 Bits partners with 60 ladies in Northern Uganda in order to provide a sustainable income and livelihood for the ladies and their families. 31 Bits provides English and finance training and seeks to give women the resources to rise above poverty. Seed: How long have you been at SEED? 31 Bits: We started selling at SEED around November of 2009. We love SEED! Seed: And we love 31 Bits! How is 31 Bits eco-friendly? Seed: Why did you start 31 Bits? 31 Bits: 5 of by best friends from college and I started 31 Bits as a response to something that was bigger then all of us. We saw need in Uganda and we could not ignore it, we had to help. We started 31 Bits with 6 women and we have grown so much in the last 2 years that we now employ 60 ladies. We felt it on our hearts to start something and what started as something very small is now changing lives of women in Northern Uganda. It has been an absolute privilege to be apart of the change that is taking part in Uganda through organizations like 31 Bits. Seed: Where do you find inspiration? 31 Bits: We find inspiration from other socially minded businesses such as Krochet Kids, Toms Shoes, International Princess Project. The ladies we work with in Uganda inspire us. Our jewelry designs are inspired by various fashion magazines and blogs. Seed: What does an average work day look like for you? 31 Bits: There is always 1-2 of the 5 founders living in Uganda full time. The Uganda side of the job consists of hanging with our ladies while they make the beads, traveling to and from the capital city to get loads of recycled paper, and working with our project managers on designs and program development. An average day in the US consists of fulfilling online orders, scheduling meetings with different partners, packaging up jewelry to send out to stores, and working hard to spread the word about 31 Bits! Seed: Do you sell 31 Bits anywhere else? 31 Bits: We sell 31 Bits all over the nation. We are compiling a list of stores that we sell in to be listed on our website. In Southern California we also sell at Almond Surf Shop, Mariners Bookstore, Yoga Works, Westerly Boutique, Toes on the Nose, and SEED! Seed: Any advice for those looking to start their own business? 31 Bits: Be ready for a lot of work, but if you feel something on your heart go for it! We started 31 Bits our junior year in college and we ran it out of our 3 bedroom apt. If we can pull it off, so can anyone! Seed: What do you see in the future for 31 Bits? 31 Bits: We would love to get our jewelry in a large retail store such as Nordstrom or Anthropology. We want our programs to be sustainable and beneficial for the community of Northern Uganda. We want to see more and more socially minded businesses being born. And lastly, we would love to one day expand our programs to other developing countries around the world. We recently stocked up on our 31 Bits jewelry and it's been going fast! So come in and get yours before it's gone! Big thanks to 31 Bits!!! BIG up for the conscious movements.